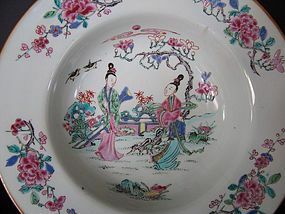 From our Chinese Polychrome Collection, a very fine Qing Dynasty barber's bowl, Yongzheng Period (1723-1735), beautifully painted in soft famille rose enamels, depicting two elegant ladies in a fenced garden setting alongside a flowering tree with birds overhead. Floral sprays are on the outer rim and on the reverse. Batavia brown / iron oxide dressing to the rim edges. Overall, this is an especially fine and decorative example, much better painted than most such pieces typically encountered. Indeed, as these types of higher quality pieces were actually displayed in 18th century barber shops as decoration, much like tradesmen of other crafts proudly displayed their own tools, these barber's bowls often had small holes bored into the footrim for hanging on the wall by twine. Such holes can be seen here in the last photo number 12. Size and Condition: 10 3/4 inches in diameter, 3 1/4 inches tall. There is a sealed hairline slightly visible, but still a good ring when tapped.